During the interview, Colbert pointed out the hypocrisy of not wanting to “confuse kids about drugs” in a country where alcohol is legal and culturally acceptable. Colbert pointed out that legal alcohol already sends a confusing message about drugs to children, which Kasich claims he wants to avoid by keeping pot illegal. 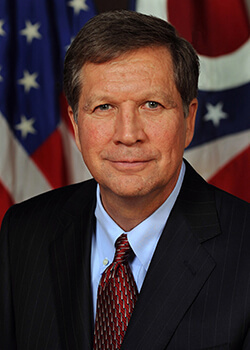 “‘The problem is we have a huge drug crisis in this country,’ Kasich said. Kasich also admitted that he’s smoked marijuana before, which, as Colbert pointed out, could’ve eliminated the possibility of him becoming governor in the future if he were caught. “When asked by Colbert if he had smoked marijuana before, Kasich said he had — and was never caught by the police. “If you had been caught smoking marijuana and had it on your record, would you be the governor of Ohio right now?” Colbert asked. ← Could Hemp Help Decontaminate Radioactive Soil at Fukushima?